We concluded on our travels that motorhome living was the simple life, but it was also the good life. We also concluded that it was a fairly “green” way of living. Sadly though, we don’t live in a motorhome any more, so we’re throwing away everything we learned about living a simple, good and green life. Nah, not really, but it turns out to be actually a lot harder to live simply, goodly and greenly (hmmm, I thought I was making up those last two words; turns out they exist already and mean something totally different!) when you’re not forced to by circumstance. We’ve been living a fixed lifestyle (as opposed to nomadic) now for nearly 10 months again and the biggest change is that we have everything we want at our fingertips. Limitless water from the tap. Limitless electricity from the wall. Limitless internet data from the little box in the corner with flashy lights. Limitless gas to cook on. With the regular bills being the only limitation on usage, it’s so much easier to waste stuff. And waste we do. I’ve stopped brushing my teeth out of a mug. I’ve stopped boiling exactly the amount of water I need. I leave my laptop plugged in sometimes. None of these are massive crimes obviously, but as an evil giant (I jest) once said, “Every little helps”. In other ways I have changed my ways – I no longer feel the need to shower every day (and only occasionally does Kiri look at me, hold her nose and point to the bathroom), but we’re still a long way from the composting toilet and solar panels that we eventually plan to have. There are other ways that we’re trying to live a green life. Our plastic consumption isn’t quite at our Lenten levels of 2 years ago, but we always use rucksacks when doing our supermarket shop instead of plastic bags and we’re overjoyed (you can tell we don’t get out much!) that we can even recycle plastic bags and plastic film now. Recycling in this country is pretty amazing compared to some places in mainland Europe. 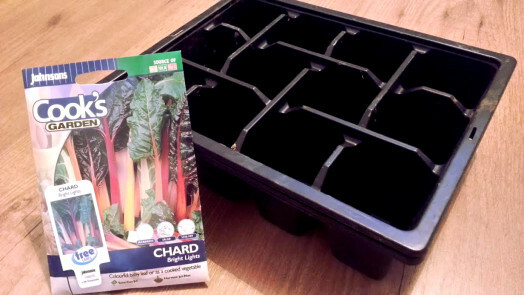 Alas, we can’t currently recycle food waste, but we’re moving shortly to a place that has a garden, so we’ll get a compost bin on the go there, then use the results on our home-grown veg; we’ll start with chard, potatoes and herbs. Our dream is still to one day emulate Tom + Barbara, but we need to find a Jerry + Margo to balance us first… and a bigger garden. Now the “simple” bit is more complicated. Obviously. The clue’s in the word… or something like that. We’re learning that to live a simple life you’ve got to be intentional. Life tends to get full of stuff if you let it happen around you. We’re trying very hard not to accumulate things now we’re no longer living in a tin box on wheels, but it’s necessary with a child on the way. We’re trying really hard to keep to the bare essentials and had (for example) agreed that we wouldn’t get a baby monitor, but when we were offered one, we realised that we could use it as a walkie talkie and found ourselves saying “thank you, yes please, we’d love a baby monitor”. If we were in a different season of our lives, the “tiny living” that Julie and Jason are doing would seem very attractive. But we’re not… and it’s still attractive. Could we make it work? 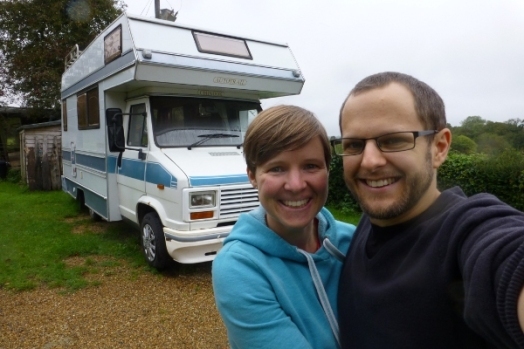 Whilst I’m musing on whether it would be practical (it wouldn’t) or fun (probably) to live full time in a motorhome with a small child, I’ll end this stream of consciousness that has found itself recorded in the form of a blog post by briefly talking about one other area of simplicity in our lives. Technology. When we were living off-grid in Bertha, we could only use our laptops when they were charged. We didn’t have a smartphone. We didn’t have a TV. We weren’t constantly connected to the internet and when we were, usage was capped. And you know what? It rocked. We read books, we played games, we talked, we went for evening strolls. Since returning we haven’t gone to the other extreme, but it’s amazing how easily the distraction of constant connectivity nibbles away at other, more edifying, activities we could be doing. It seems almost too much of a co-incidence that as I’m musing about possibly introducing a digital Sabbath to my life, I find out that this Sunday (28th June) is National Unplugging Day. It’s aimed at parents, but I think that it’s a good exercise for anyone. We’ve still got a long way to go until we’ve reached the dizzying heights of the “proper” good, simple and green life. But we’re on the path. It’s probably because we’re short that tall places are very appealing. When we were travelling, the first thing we’d do when arriving in a new city was try to find something to climb to help us get the lie of the land. Yet for some reason when we previously lived in London, we were like sheep and followed everyone underground. Now we’re back in London, we’ve decided to make amends, so we’ve been taking every opportunity to see the city from above, including taking the bus more; it’s not only toddlers who like sitting on the top deck! Our first port of call was The Shard. You can’t get much taller than that (well, at least not in Western Europe). We’d watched the weather forecast like hawks and as the booked evening approached, it wasn’t looking good (unless you like thunderstorms… which actually could have been very cool to witness from the Shard). As it was, once we’d taken the two lifts up to the 68th floor, we emerged to see a mottled city with some parts in bright sunshine and other parts shrouded in cloud. Photographs don’t do the view justice; with stabilising devices banned (don’t try to ask a member of staff why… you’ll regret asking! ), dirty glass and lots of reflections, the best you can aim for is a series of snapshots of an ever-changing city. From that height, London is a just a detailed model, reminding us very much of the Miniatur Wunderland in Hamburg. Allow me to indulge in a bit of technology admiration though. Ever since a computer vision module at university, I’ve been dreaming about being able to look out of an aeroplane window and have a map overlaid on the landscape to show me what I’m looking at. 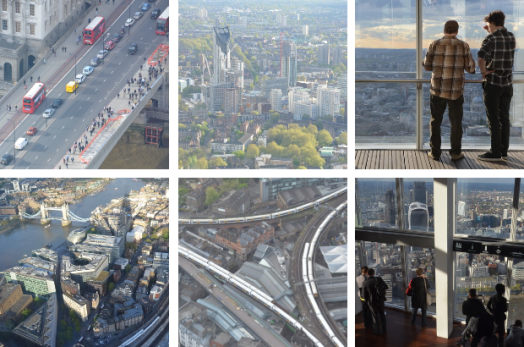 This dream is a reality from the top of the Shard. Dotted around the viewing platform on the 68th floor are devices that look like giant computer game controllers, with a screen at the back, a camera at the front and the option to zoom in on points of interest. With an augmented reality overlay you can read bits of information about, for instance, the Olympic park. Even better, you can switch from “live view” to see what it looks like at night, at sunrise, and what it looked like in 2012; all retaining the option to pan around. And don’t even get me started on the Dyson Airblade Taps in the toilets at the bottom of the Shard (so that’s how they spend the entrance fee money!)! South London view done, we decided to take the cable car at Greenwich over the river a week later. This time we didn’t need to book; we just rocked up with the requisite £3.80 on our Oyster cards and queued next to the O2, reminiscing over our visits when it was the Millennium Dome. Once packed into the cable car with 6 other passengers, the 10 minute journey was a little underwhelming. Don’t get me wrong; it was quite a novelty, but it wasn’t anything particularly special. We were afforded views of Canary Wharf, the dome and London City Airport, which, whilst interesting aren’t the most iconic of views in London. Once at the other side we didn’t really know what to do with ourselves; if it hadn’t been a Monday, we probably would have looked around The Crystal (an exhibition focusing on urban sustainability), but as it was we just hopped on the DLR back to Lewisham. So, we’d “done” south London and travelled over the river. Time for north London – more specifically the “car-melting walkie talkie of doom” (well, the Sky Garden on the 35th floor). Now we’re aware this is a controversial building and in fact one of the reviews for visiting said that the best thing about it was that once you’re at the top, you can’t see the building itself. Whilst we agree that it’s not the most pleasant building to look at, it’s lovely once you’re inside. It almost feels like you’re slung under an airship in a 1950s vision of what a “futuristic” London might look like. The “garden” isn’t particularly mature and the plants are fairly sparse, but maybe that will improve with age. As for the view though, it’s every bit as good as the Shard, even though you’re at half the altitude. From the lower perspective you feel more connected with the city (sorry to sound a bit hippy-ish) and some of the lines of sight are cracking. And you know what? It’s all for free (unless you choose to take out a small mortgage and buy a drink). One question remains though; what should we climb next? Easter. The day that we remember the sacrifice that Jesus made for us and try to get our heads around the fact that he conquered death, so that we might have eternal life with Him. Awesome stuff. Also, this year it was the day that we heard that Bertha has been given a facelift and is on the market once again. We have to say we’re a little surprised that her new owners have decided to sell her on so soon, but she’s looking good. When we were Bertha’s caretakers we were wary of making to many changes to the outside of her; mainly because we were cautious about damaging her seals. However, we also didn’t want to make her look too attractive to thieves on our travels (which worked out well for us, as we had no break-ins!). However, her new owners look to have done a great job on her; from the photos on the advert we’ve spotted new panelling, a re-painted cab, the rear ladder having been removed and what looks like a new rear bumper (the previous one had damage when we bought her; we think she’d probably had a rear impact prior to our ownership). With the addition of a couple of new vents to help to deal with condensation issues, she’s looking really smart. But it’s not just the outside they’ve focussed on; Bertha’s now got a new carpet inside and new upholstery (we’ll admit that 8 months of permanent living in her had maybe left her looking a little tired). Under the bonnet she’s apparently also been given a new clutch (it was always a “fun” game to try to get her in reverse!) and the mud and snow tyres that carried us on our 12000 mile jaunt around Europe are listed as having been replaced too. We let the new owners know as soon as we found out and we’re repeating it here, just in case the “new” new owners end up reading this, as we would hate for something to happen and them not be suitably protected. Anyhow, it sounds like an exciting time for Bertha as she begins her new life full of new adventures. And as for us? Well, we’re settling back into life in London and we’re expecting another “new life”. Now that’s going to be a new adventure! About 9 years ago I was a member of a few social networks… I’d picked a username and I was spending a few minutes a day chatting to random people about random stuff and playing online games. I then received an invitation for the newest kid on the social media block, Facebook; a site where some of my “real life” friends were members. And there started my journey with Facebook which is ending imminently. Apparently I’d just bought a new car. There are a couple of reasons why I’m leaving and I’ll start with the weaker reasoning first. I aim to live as simple a life as possible without too much extra stuff or gadgets and I’m pretty happy with my current position with regards to de-cluttering physical “stuff”. I don’t do so well though with digital “stuff”. We live in an information age where we can access almost anything from almost anywhere (apart from if you live rurally!). There’s so much information out there and I think I probably binge a bit too much on it and over-consume. Social media is great for seeing what other people are doing, updating others on what I’m doing… but I sometimes wonder if I’m so busy reading what other people are doing remotely, or planning how I’m going to document what I’m doing that I don’t live fully in each moment. So if I close one social media door, I should be able to reduce my daily information consumption. Now, onto the main reason why I’m saying goodbye to Facebook. Control. When we move into the realm of online communications (as opposed to simple browsing), there’s a minor paradigm shift. I’m no longer just consuming content, I’m also producing my own content. Taking emails for example, if I were to use Google’s Gmail through a desktop web browser, relevant adverts would appear next to emails. How do I feel about that? Well, I’m not entirely happy, but I’m easily placated by the thought that it’s an algorithm that’s selecting the adverts based on keywords in the emails. Before we’d publicly announced our engagement, there were a few emails floating around with marriage-related keywords in there… which invariably led to marriage-related adverts. Once again though, if I don’t want the adverts or the tracking, then I can choose a totally different email provider. And then we get to social media. It’s only when I came to download my Facebook data archive that I realised how much of my life is in that 70Mb zip file. The Facebook help page about categories of data they hold makes for interesting reading. From the very beginning I’ve been wary about putting my whole life online, I mean why would anyone care about films that I like? But, as a lot of my friends have been using Facebook too, over the years there have been countless events, messages, pictures and life events shared. Worth lots of money to advertisers. When I was doing wedding photography, through Facebook I was able to show an advert for my services to anyone who had shared their location as within a 10 mile radius of my home address who had just changed their relationship status to “engaged”. That’s very specific targeting, which advertisers will pay for… and it’s kind of still fair enough. But then we get to the bit that makes me uneasy. If I don’t want the adverts or the tracking, then I could choose a totally different social media platform… but all of my friends would have to do the same. I was attracted to Facebook in the first place because that’s where there were people that I knew. What keeps me loyal to Facebook is the same thing. I can’t just move to another social media platform, such as diaspora* unless enough people move with me. And so I’ve stuck with Facebook because that’s where my friends are. But I’ve never appreciated the way that they treat me as a supplier of my information. Over the years I’ve had to fight for privacy; I’ve regularly had to check and change privacy and security settings. Every time they’ve added a new sharing option (such as location), the default has been “on”. You can understand their business reasoning; their business is information, so sharing is good. But it doesn’t respect me as a data owner. When you post User Content to the Site, you authorise and direct us to make such copies thereof as we deem necessary in order to facilitate the posting and storage of the User Content on the Site. By posting User Content to any part of the Site, you automatically grant, and you represent and warrant that you have the right to grant, to the Company an irrevocable, perpetual, non-exclusive, transferable, fully paid, worldwide licence (with the right to sublicence) to use, copy, publicly perform, publicly display, reformat, translate, excerpt (in whole or in part) and distribute such User Content for any purpose, commercial, advertising, or otherwise, on or in connection with the Site or the promotion thereof, to prepare derivative works of, or incorporate into other works, such User Content, and to grant and authorise sublicences of the foregoing. Now I’m not a lawyer, but in essence that seemed to be saying that I had to be willing to give up the copyright that I as a photographer own. In theory, Facebook were gathering a lot of images that they could potentially sell on in future, without giving any credit to the photographer. Hmmm. But, I convinced myself that I must have misunderstood the wording so I stayed and besides, all of my friends were still staying, so maybe I was just being overly cautious. So for the last 6 years I’ve been using Facebook, with the knowledge that I don’t actually understand how Facebook might be using my data. 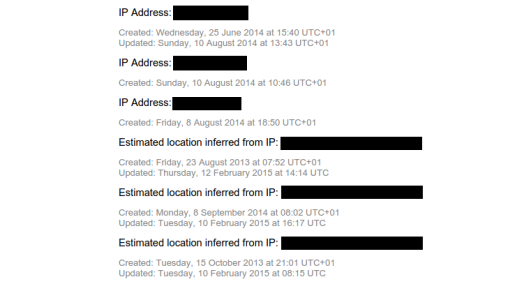 I was a little surprised to find in my Facebook archive a list of every IP address that I’ve logged into Facebook from, a list of all of my previous friends and a list of previous email addresses. Even if I understood what purpose they were originally holding that information for, surely they shouldn’t be retaining it indefinitely? But then again I guess the Data Protection Act doesn’t apply to Facebook as an American company. And then a week ago I read a pretty damning article about Facebook (it’s worth a read) where I learned that my name might be being used next to promoted posts, which could be misconstrued by other people as me endorsing something that I might not ever have read. Woah. Hang on a minute, I’m not ok with that. I don’t use Facebook on my phone, so there are some things such as GPS tracking that are mentioned in the article that don’t apply to me. The crux of the matter is that I no longer feel in control of my profile on Facebook. 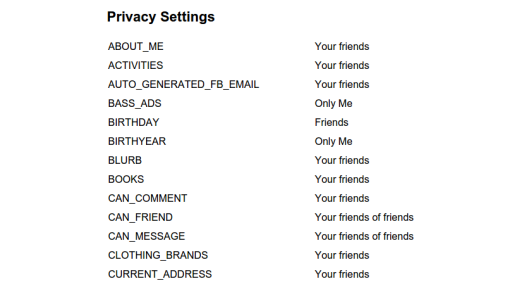 For the last 6 years I’ve told myself that it’s fine as I’m aware of what Facebook is doing with my data and I can set privacy controls accordingly. But now I realise that I don’t know how this private company is making money out of me. And I don’t like it. So, as Duncan Bannatyne would say, “count me out”. If you’re reading this via a link on Facebook (which I’m sure many of you are), don’t take my exit personally. Email me, text me, write me a letter or pop round for a cup of tea. I want to maintain the friendships, but not in a territory where I don’t know the rules. … through the hard times, and the good. To be honest, it seems much longer than the 19 months that we have shared together. After a few hiccups in our early relationship, which were resolved by spending a lot of time together, Bertha (who did you think I was talking about?!) turned out to be reliable, steady and dependable; we really couldn’t have asked for more. We couldn’t have completed our adventure without her. It must have been love, but it’s over now. For the last couple of months, this van that was born to be wild has been sitting sad and lonely on the drive; she just can’t wait to get on the road again. And so Bertha decided that it was time to move on and find new carers. Breaking up is never easy, I know, but we wanted to make sure that her new home would be a good one… we didn’t want to sell her to someone who wouldn’t care for her. So when Mark and Clare came to view Bertha, we were trying to discern whether she would receive the love she deserves from them. We were convinced. They are such lovely people and we have no doubt that they will treat her well. In fact, we’re excited to hear that Mark has plans for renovating the outside to add to the renovations we did on the inside. The icing on the cake was when Mark said that if we ever want to visit Bertha, we are welcome to take her away for a little trip. It’s re-assuring to know that there’s a possibility that we’ll meet again. Don’t know where, don’t know when… but I know we’ll meet again. Maybe some sunny day? Maybe not… to be honest ain’t no sunshine when she’s gone. Think of a friend who has been beside you for some of the greatest moments in your life, but also in the struggles. Thought of one? Good. Now imagine selling that friend (bear with me; I know it’s an odd concept). Bet you can’t. But for us, it’s sadly necessary (please read the next sentence before calling the police!). The friend in question is obviously Bertha. She’s carried us safely through many countries and been there as we’ve laughed, cried, shouted, sung and danced. As our big adventure is over though, we’re looking towards our next big adventure… starting a family hopefully… which we’ve heard can cost a little bit of money. Therefore, it’s time to bid farewell to Bertha. Having passed her MOT with flying colours, we promised her a bit of a pampering session to remove 20 countries worth of mainland European dirt, grime and squashed flies. Inside wasn’t too bad… after all we’ve been living in her full time, so we’ve kept her in good shape. The outside? Well, our thinking when travelling was that she’d be less of a target for thieves if we let her be a bit grubby. Now was her chance to shine again. We think she scrubs up quite well! 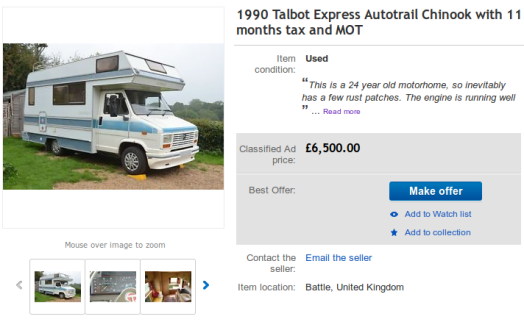 And so to eBay, where we’ve listed our beloved Bertha under the impersonal title of 1990 Talbot Express Autotrail Chinook with 11 months tax and MOT. This factual, sterile and clinical listing hides the many months of time, money and love that we’ve invested in making her our home… in fact, the first marital home we have owned. How do you put a price on that? Well, ideally we would have liked to have listed Bertha for over £7000, but we are well aware that whilst in the care of one of her previous owners (or maybe several of them), there was damage to her rear. Whilst we haven’t been aware of any ongoing adverse effects or any deterioration since we replaced the floor in one of the rear corners, the fact remains that she does have this imperfection. Therefore, we’ve priced her to sell at £6500… although we are open to discussing sensible offers. So, it’s over to you. Can you offer Bertha the love, support and companionship that she yearns? She won’t let you down, and you can’t use the excuse that you don’t know where she’s been…! Hindsight is a funny thing. We thought that we had a pretty good idea about what we were letting ourselves into when we set out in Bertha. So, let’s look back on some of the questions that people asked us prior to the trip, including the answers we gave then and our answers now we’ve actually done the trip. Which countries in Europe are you going to visit? Having decided that Ukraine may be a little unsafe and that we probably wouldn’t get up to the top of Scandinavia within the time (and budget! ), our final list came to 20 countries; Austria, Belgium, Croatia, Czech Republic, France, Germany, Greece, Hungary, Italy, Liechtenstein, Luxembourg, Macedonia, Netherlands, Poland, Portugal, Serbia, Slovakia, Slovenia, Spain and Switzerland. But not in that order. France was indeed the first stop of both loops. We took 4 days to get to the Swiss border on the first loop, then only 1 day to get to the Belgium border on the second loop. We spent a few days in the south of France on our way to Spain in January and a few days in the north of France at the end of the second loop, but aside from that, we’ve left France for exploring properly at a later point in our lives. A year…but with a gap in the middle, as our breakdown cover requires us to return to the UK after 180 days. We’ll use this as an opportunity to visit friends and family that we’ll no doubt be missing by then. In reality, this turned out to be 8 months on the road, with a month back in the UK between the 2 loops. We were right about missing family and friends though; they were the biggest draw back to the UK for us. After extensive research we have concluded that it won’t be possible for Steve to get pregnant, so we’re not worried. We were quite successful with learning a few stock words and phrases for each country we visited, although Greece proved to be the trickiest (due to the different alphabet). Often I’d start a conversation with a practised phrase, then have a moment of panic when I realised I didn’t understand the response and therefore would have to revert to English. As we spent such a short time in each country, I don’t think the languages had time to make it into our long term memories! Do you know a lot about engines? It depends on your definition of “a lot”. If by that you mean “very little”, then yes. We do have breakdown cover that covers us across the whole of Europe and we will have duct tape, cable ties and a hammer to hand. Our knowledge of engines has certainly grown in the last year as various things have needed to be tweaked. Our two breakdowns turned out to be very minor problems; the first a blocked air filter (caused by a leaky exhaust manifold which we fixed between the two loops) and the second a disconnected idle cut off solenoid. Not bad at all for a 24 year old motorhome. The duct tape, cable ties and hammer were all used at various points, but not on the engine! What will you do if you meet a bear? We didn’t meet any bears. In fact, we didn’t have any run-ins with wildlife, apart from mosquitoes! Actually, that’s a lie. A duck flew into Bertha in the early hours of one morning as part of what we can only assume to have been a mating ritual. Are you taking an umbrella? 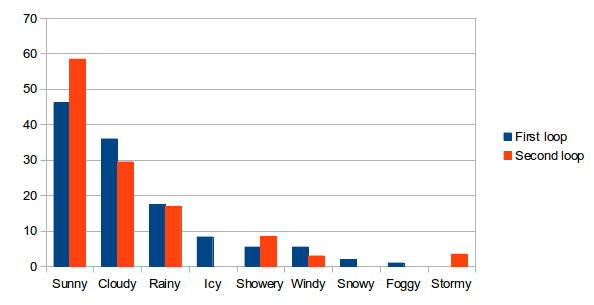 Although it didn’t always feel like it, we actually had a lot of dry days as we were travelling. We did actually take an umbrella, which came out probably once or twice as we preferred to wear waterproof coats. How are you funding a year of travelling? Well, the money did last a year. Our frugal living had to continue on the road as well to make sure that the money lasted, so we had very few meals out and always thought hard about paying for visiting attractions. But there was so much that we could do, see and appreciate for free in each country, that we didn’t feel like we were missing out just because we were keeping an eye on our budget. There were some areas of our travels where we realised how naive we’d been in our expectations (thinking that we’d be able to cover the WHOLE of Europe in a year), but other areas where we were spot on. One of the biggest lessons that we’ve learned from all of this is to not hold on too tightly to plans and expectations. It’s when we’ve ventured into the unknown and just gone with the flow that some of the most exciting things have happened. Let’s hope we can carry that forward into our lives post-trip. Exam season. Those sleepless nights as you wait to hear the results of your loved one. The inner searching to decide how to react if the results aren’t quite as you hoped. Well, as it happened, we needn’t have worried about the MOT. I mean, we would have still loved Bertha had she not passed first time and we would have even paid for resits, but it was lovely that the only unexpected work she needed was a fresh rear numberplate light. So we’ve been back in the UK now for nearly 3 weeks and our feet have hardly touched the ground. Between catching up on paperwork, filling in tax returns, visiting family and trying to negotiate the Hollywood contracts for “Bertha – the musical” we haven’t had much time for Bertha since her exam success. But as our time with her is coming to a close, we’re pampering her a bit; getting her ready for some new owners. First job; the fresh water tank. Do you remember the “fun” that we had in Slovakia when it fell off? Our angel, Eddie, was indeed right when he said that the ratchet strap would hold it until we got back to England, but now was the time for a permanent fix. With the ratchet strap and duct tape removed, the broken bracket hung down; still surprisingly strong. But not quite as strong as the nuts and bolts that connected the bracket to the chassis… nicely welded shut with 24 years of rust. After a good hour under Bertha, during which time I managed to break a socket, a hammer and my phone, I finally resorted to the hacksaw for the stubborn nut and bolt. Bertha is surprisingly well constructed! With the old stuff gone it was plain sailing to create a new, strong sling from a 20mm builders’ band. I can’t say I’m a fan of the original straps that were used (sorry Autotrail) as they have a tendency to drop with the weight of a full tank, hence our original problem. Saying that though, the other original strap still appears to be doing its job quite well, so it made sense to leave it be. So that’s all done. Next job? Cleaning off 12000 miles worth of mainland Europe dust and dirt without disturbing any of Bertha’s seals. Maybe we’ll just book her in for a luxury spa treatment. After all, she deserves it! How green is motorhome living? So let’s start with the fuel, as that’s the most alarming headline. As a 24 year old vehicle, Bertha’s fuel efficiency and emissions aren’t the best. Using a carbon emission value of 8.91kg of carbon per gallon burned, on petrol alone we’ve possibly released around 5300kg of carbon over 8 months of travelling. In comparison with air travel over the same distance (0.277kg per passenger mile for 2 passengers), that would have been 6580kg and if we compare it with long distance rail travel (0.185kg per passenger mile for 2 passengers), that would have been 4394kg. Don’t get us wrong; it’s a lot of carbon, but suddenly motorhome travel isn’t looking as bad as first thought. If we had chosen to do our travelling by train, we would have then had to think about accommodation on top of that (not physically “on top” obviously) and the heating and lighting carbon costs incurred there. As Bertha’s leisure batteries are hooked up to the alternator, some of the combusted petrol would have gone to recharging them, with the rest of the recharging being performed by our solar panel. We chose our electrical devices carefully in terms of consumption (for example “dumb” phones instead of smartphones and LED lighting throughout) and as we were using so little, we are confident we could survive off-grid indefinitely. So, aside from the one-time carbon cost of manufacturing the solar panel, our electricity usage was effectively zero carbon. As electric heaters use masses of power, we used our gas heater in low temperatures, as well as using gas for our water heater, our cooking (on the hob; we removed the oven to give us extra storage space) and our fridge (when parked up). We used approximately 140 litres of LPG in the trip (about £87 worth). Now I haven’t examined our domestic gas usage in terms of volume, but certainly in terms of cost you’d be talking about more than £87 worth of gas for 8 months. It’s hardly surprising that we used less gas than we would in a house, as it’s a much smaller space to heat. So from a gas-usage point of view, again, motorhome living is looking quite good. Probably the one utility that we were most aware of in terms of usage though, was water. 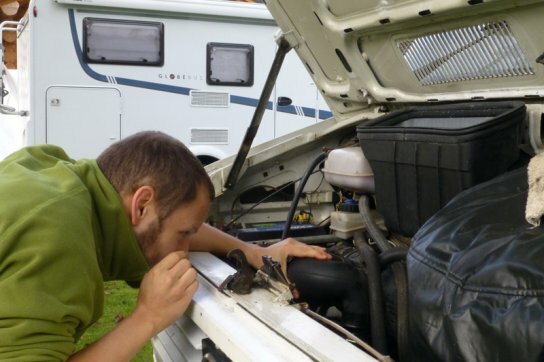 Unlike a house, you don’t have a pipe connecting you to the mains; the only water that you have in a motorhome is that which you carry and once it’s gone, it’s gone. Using figures from the Consumer Council for Water, a 2 person household with a low water usage (55 cubic metres per year) will get through about 150 litres per day. Bertha’s fresh water tank holds 40 litres. A full tank would last us at least 3 days of wild camping (unless we were hand-washing our clothes). So how did we reduce our water consumption? We didn’t wash ourselves as frequently as we would in “normal” life. Kiri and I had different ideas about when it was necessary to wash… to clarify, I’m the dirty one! Now I try not to have too many vices in life, but I love a good, hot shower, so it was a real luxury to arrive at a campsite and realise that we could have a shower or use a washing machine! So, motorhome living again is looking pretty good in terms of water usage. Finally, we come to recycling. In the UK, we’re keen recyclers and try to put as little as possible in the bin. A couple of years ago we even experimented with giving up buying things in plastic for Lent. When travelling around, especially in different countries, things get a bit harder though. There’s no regular collection and different countries have different recycling facilities. Finding them was sometimes a bit of a challenge, so we couldn’t always recycle. One thing we did notice (and really like) was the “pfand” system (direct translation is “ransom”) in place in several countries. When you buy a bottle (plastic or glass), you pay an extra little deposit on it. Then when you’ve finished with it, you return it to the place you bought it from, and get your deposit returned. In the case of glass bottles at least, the bottles are re-used rather than recycled; probably a less energy-hungry process. Overall, I think we’ve probably been living a greener lifestyle in the last 8 months than if we were living in a normal house. So is there anything that we can translate back into our lives in the UK? Maybe. I guess the main thing is that we’ve learned to be frugal with the resources we’ve had. However, there are some slightly more wacky ideas that we might try to follow up. As toilets are the biggest users of water, we might do some research into composting toilets. 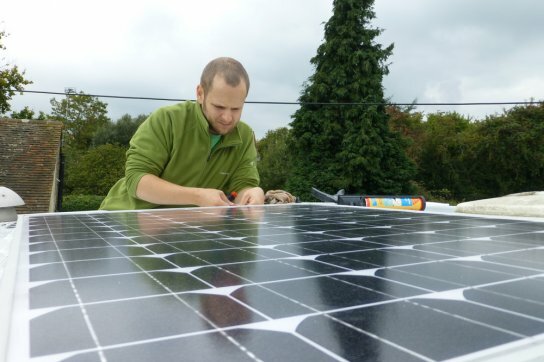 We also think that the idea of hooking up a solar panel to a 12V battery, then charging things from that might have some mileage. We’ll see! Once upon a time, a girl had a simple dream to travel around the world. She didn’t mind how. She didn’t mind where. She would just blow with the wind. One day, she met the boy that she knew she would marry. In the run up to their marriage, they talked about the dream and the boy liked the idea of it. Only he liked to plan things. So he started to ponder and research how best to stretch a small budget to see as much of the world as possible. 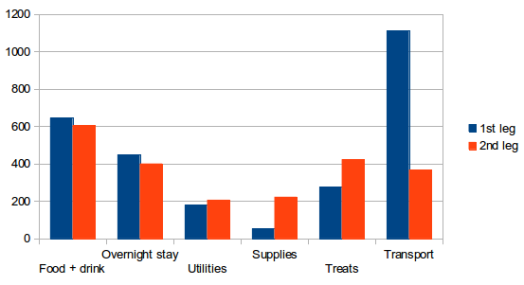 Accommodation and transport would be the biggest cost; how could they be combined to save money? A motorhome. As planning intensified, it became clear that the geographical boundary would need to be mainland Europe… but how much does it cost to tour Europe in a motorhome? Enter pioneering data-lovers Adam + Sophie and Julie + Jason with very thorough accounts of their motorhome trips around mainland Europe. After scouring their records, the budget was set; £1000 per month. Roll the clock forward a few months and the boy and girl were… stuff this, I’ll stop talking in the third person. We thought that a year would be a good time frame for travelling, so we’d need £12000 once we’d bought the van. Our first year of marriage was a very frugal one as we put aside as much money as we could on top of what we’d already got in savings (from regular saving over many years as well as wedding gifts), but we reached our target amount. To cut a long story (which is all documented in this blog!) short, we finally set out on the trip 3 months after we’d originally planned, having spent the budget for those 3 months on getting Bertha prepared… and living during that time. Add a month back in the UK in March, seeing family and having more repairs performed on Bertha, and we ended up spending 8 months in total on the road… coming in a little under budget. And us? Well, we travelled 11878 miles over 242 days between 2013 and 2014. These figures though hide the fact that in reality ours was a trip of two halves where we did things differently in the second half. On our first loop, we travelled 7368 miles as opposed to only 4510 miles in the second loop. Both loops were roughly the same length (122 days and 120 days respectively) but by co-incidence we only drove on 91 of those days on each loop, giving an overall mean of 65 miles per driving day. Most of the costs of a motorhome trip are dependent on how many days you’re on the road… apart from fuel, which depends on the number of miles that you’re travelling. So, what was the damage? 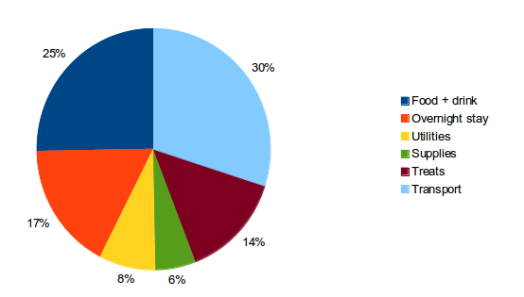 However…it’s worth noting those that these figures are based on cost of fuel rather than fuel efficiency. As we found out, the price of fuel varies massively between countries, so assuming that a high cost of fuel correlates to low fuel efficiency isn’t a given. Additionally, fuel efficiency can be affected by many things; quality of fuel at pumps, the terrain and driving style to name just some. However, does choosing a coachbuilt van over a more streamlined a-class or panel van conversion make a difference in cost? It would appear so. Does the fuel type make a difference too (Bertha being the only petrol van)? Maybe… in hindsight it might have been cheaper for us to convert her to run on LPG, but we have no concrete figures to back up that suggestion. So moving on from the cost of travel, we come on to the cost of living. This is so subjective; if you were to stay on a campsite every night and eat out at restaurants the whole time, of course your cost of living would be higher than if you were to aim to stay on aires / wild camp and cook in the van the whole time. There’s also the question of whether you take toll roads when you travel and how many galleries / museums / attractions you choose to pay for. For this reason (and because we’ve all used different categories!) it’s unfair to directly compare how the different couples chose to live on the road. However, there is an interesting comparison between the first loop of our trip and the second in terms of what we spent. On the first loop we covered a lot more ground, and were at the receiving end of great hospitality at a lot of different projects that we helped at. We also took ferries from Greece to Italy, then from Spain back to the UK (rather than from France), which made a massive difference, as did the unexpected Swiss breakdown. 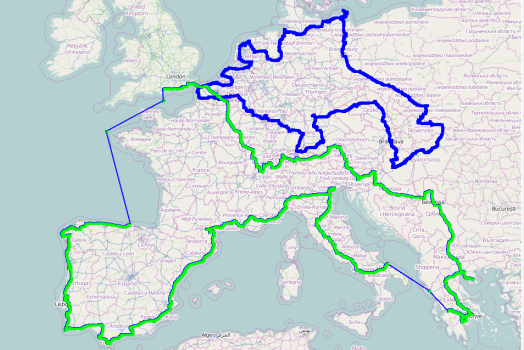 With the second loop, we travelled at a more leisurely pace and were a lot more self-sufficient (although we were treated like royalty by the people we visited in Germany + Belgium). Whilst this could be broken down further into costs per country, we’ve found from our own figures that this can actually be misleading. Where we were about to cross a border from a “cheap” country to an “expensive” country, we made sure that we stocked up on food and fuel in the cheap country. Similarly, we would let supplies run low in the more expensive countries if we knew we were moving to a cheaper country. This had a smoothing effect on the country averages; making the expensive countries seem cheaper and the cheaper countries seem more expensive. But then again, the definitions of “cheap” and “expensive” countries is subjective. So, the moment you’ve been waiting for; the total cost per day of life on the road for us was… wait for it… £33.45. Much cheaper than living in London! However… it should be noted that none of these figures include vehicle tax, vehicle insurance (which isn’t insignificant if you’re full-timing), travel insurance and breakdown cover. 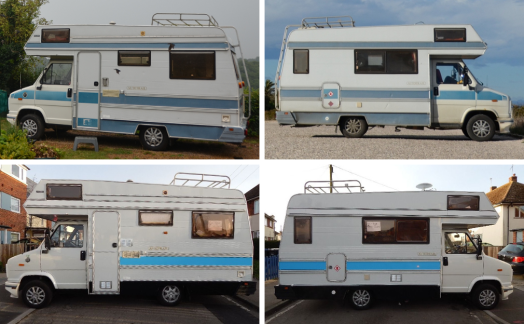 But, the good news is that depreciation on second hand motorhomes (or in our case an eleventh-hand motorhome!) is minor if you take care of it. Once the adventure is over, should you choose to pass on your home to another keeper, it should be possible to get back near enough what you paid for it (or at least that’s what we’re hoping). There are many more caveats that could be added to this data, but hopefully this gives a rough idea of what your trip around Europe in a motorhome might cost. Go on, you know you want to!